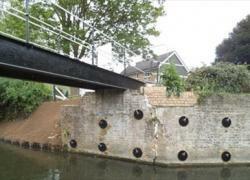 The River Stort Bridge was scheduled work as part of the Canal & River Trusts Bridge Maintenance programme. 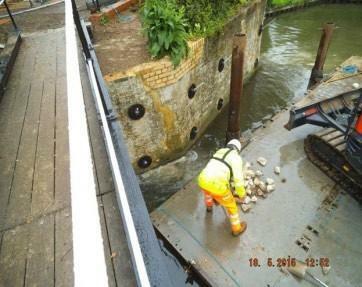 In early 2015 Greenford Limited were selected as the specialist Contractor to repair and reinforce the concrete supports of the bridge. Anchor Systems (International) Ltd (ASIL) were engaged to design and supply the mechanical ground anchoring system to a very rigid specification to maintain the aesthetic look on the abutment faces with new pattress plates. The design was further complicated due to the weak ground conditions encountered and the obstruction of an existing foundation created by the lock adjacent to the bridge abutment. ASIL completed a site test for the AS200 and mechanical ground ground anchors to understand exactly the resistance of the soil with respect to the preliminary ground anchor system identified. The tests were successful in the loads required to be achieved to ensure the physical site test reflected the engineering. ASIL engaged with the engineering team from the Canal & River Trust and Hyder. A solution was developed with ASIL’s engineering team and an installation method was developed. 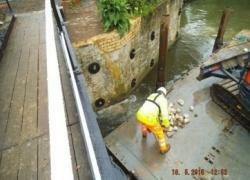 The installation method was complex as the installation had to be completed with the use of an excavator on a barge. A further complication that had to be overcome was that the low bridge impeded the angle of installation of the ground anchors directly below the bridge. Once again the engineering had to be adjusted to allow for compound angles of installation as shown in plan above. Many of the installed anchors were individual in their angles and depths of installation to accommodate the many difficulties manifested on site. The project was completed in an acceptable timescale even with the challenges encountered. The ground anchors all achieved an acceptable loading capacity and ASIL provided another ground anchoring solution tailored to the customer’s requirements in a marine environment.